Karina's Kreations: Stampin'Up Bloomin Bouquet Project Kit! 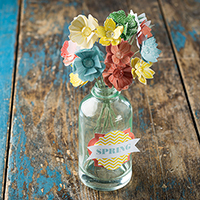 Stampin'Up Bloomin Bouquet Project Kit! Do you need some cute gifts? 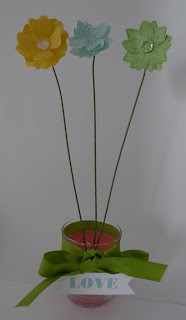 Check out this flower arrangement I made using the Bloomin Bouquet project kit #134542 $15.95 while supplies last! There's even a video showing how to assemble the flowers. It's quick & easy. You just need a glue gun! I inserted my flowers into a candle so it's double gift! Wouldn't this make a great teacher gift too? I hope I have inspired you to make a special gift for someone.